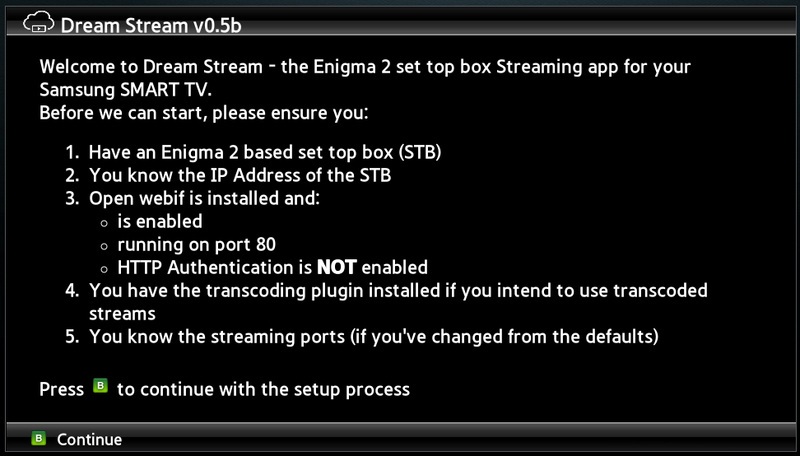 E2Stream allows you to stream/transcode channels from your Enigma2 Set top box to a compatible Samsung SMART TV. This has been reported to work on E Series, F Series and H series SMART TVs, and is not currently compatible with the older D Series models. To have Open WEBIF installed, enabled, running on port 80 and WITHOUT HTTP Authentication. 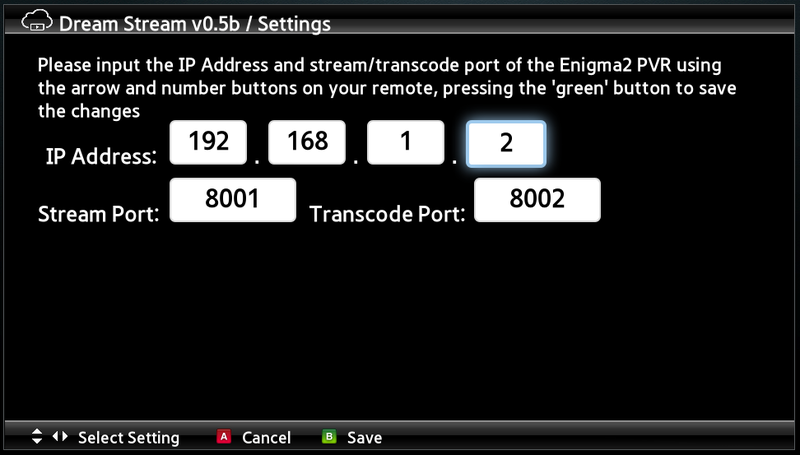 Next, enter the IP address of the Enigma2 based Set top box. You can enter 3 characters in each box of the address. On the 4th entry, it will reset and use this character to start that octet again. 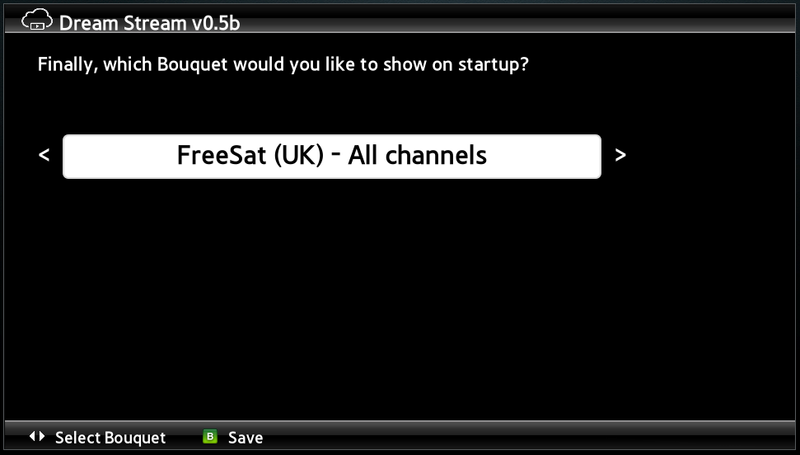 Finally, you get the option to default which Bouquet DreamStream shows on startup. Note – to control this, use Up/Down to browse the channel and Left/Right to change the bouquets. On moving through the list the NOW/NEXT updates on the right. Press the ‘enter’ button to play and switch between full screen, noting that if you’ve switched to a different channel in the list, it will just play this rather than changing the currently playing channel to be full screen. Press the RED button to go to the settings screen. Press BLUE to show the about screen. thanks for this fantastic software. Runns really great on my Smasung H6290 with my dreambox 800. Good job. Little feature request: I have a single tuner and have to switch channels manually. A automatic switching would be great. I’ll implement a zap channel option for those with a single tuner in a coming release! This is a great app but are there any plans for it to work with HTTP Authentication on the WEBIF? I would like to stream from my receiver from outside my home network but it requires me to open the WEBIF port, which probably isn’t a good idea to do without password authentication. Is it a case or either/or, or is there a way round it that lets me enjoy E2Stream at home and use a streaming app over the internet when I’m away? Whilst I’d never advocate opening your box to the outside in this way anyway, I can appreaciate why people do. I’ll look at putting authentication details into a later version but this requires an onscreen keyboard to input a alphanumeric password so isn’t an insignificant change. I’ve emailed a request to you for more information. Hello! I have the same error while retrieving channel list: TimeoutError: DOM Exception 23. Please help! OK, I see the problem occurs because of too many channels or too many bouquets. If I remove most of them it works but as I have motorized dish I prefer to have all satellites… How many channels or bouquets can we have? Or could you change the timeout period to X minutes? Unfortunately I don’t think the TV supports the subtitles they way they’re transmtted in the stream – there is code in there to handle them but it never detects them even though I can see they are present in the stream. I’m still researching this to see if there’s anything else I can do – sorry! when the tv manages to detect multiple audio channels, you can press the red ‘A’ button to change. Thank you for this soft. Is it possible to use a no-ip (dyn-dns) address instead of a local IP because my device isn’t located in the same place ? Not yet – but only because the screen input is a numeric ip-address. Thanks for a great app! I would also like to make a request for HTTP authentication and support for domain name inputs. Must not be HTTPS and must not require authentication. I.e. the URL you put in your browser must be http:// and must remain on HTTP and need no credentials for it to work. Its currently not compatible with the J series TVs unfortunately. I’m working on it as I get the opportunity. Hello pembp,you wrote: “….is not currently compatible with the older D Series models” I’ve got an UE40D8090 does E2Stream work with this model? It’s unlikely to work due to limitations of the TV/codec support – sorry! Why is it not detecting multiple audio channels? I find that some channels have an English Channel and a Narrative channel. Pressing the A button shows there is 1 of 1 audio channels playing when actually there are two. Unfortunately E2Stream can only see the Narrative channel so that\\’s played by default. It\\’s a bit irritating and can only be fixed by deleting all the narrative channel PIDS in a channel editor. thanks for this great app! 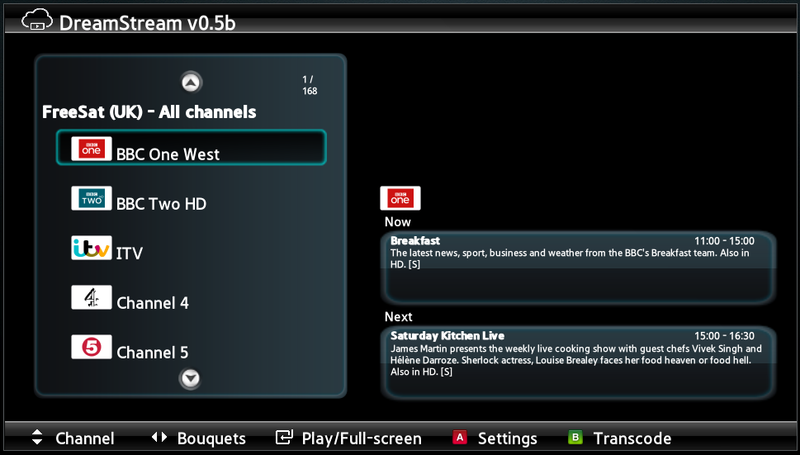 I installed the version 6.5 on my Samsung UE32ES6307 to stream from my DB800HD (1 tuner). The app starts to stream correctly the channels, but after around 30 to 45 seconds the screen becomes black and the stream stops (or sometimes the channel goes into buffering). Any idea what can be the cause? i love this app on my SAMSUNG SMART tv, but would love it on my other LG SMART tv! is there any chance,you will develope this to work on LG tv’s?? Probably need change settings in your E2 satelitte box allow stream different channel, not only mirror. after channel select – error “the object can not be found here” and “error message NotFoundError”. e2stream v6.5, vu+ duo2 with open atv 5.3, samsung UE22ES5410, samsung UE65H8090. Is it a scrambled channel? I’ve found your great app, thanks, it is working good on my UE46EH5305. There is one thing what I really miss, it is the support for http authentication. Have you any plan to implement it? Not right now, but maybe at some point in the future. I don’t use HTTP Authentication as my E2 box is only available on my private lan, and I wouldn’t expose it to the outside world (even with authentication turned on) due to the various hacks that could take place. Rather I connect via a VPN or SSH with Certs/Tunnelled. Are the instructions any different for J series Samsung TV? Any news on working on UE40J5248 ?